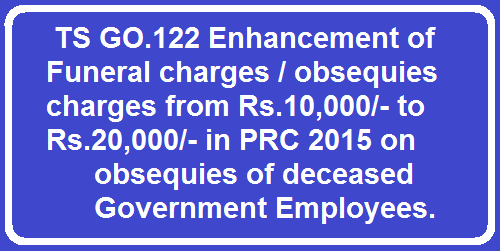 TS GO.122 Enhancement of Funeral charges / obsequies charges from Rs.10,000/- to Rs.20,000/- in PRC 2015 on obsequies of deceased Government Employees. Funeral Charges in RPS 2015,Obsequies charges in RPS 2015,Funeral Charges in 10th PRC, obsequies charges in Telangana,Obsequies charges on obsequies of deceased Government Employees, Enhanced amount of Funeral Charges, Recommendations made by the 10th Pay Revision Commission to increase the amount of funeral charges to Rs. 20,000/-. Services Welfare - Welfare of Government Employees - Sanction of expenditure on obsequies of deceased Government Employees - Enhancement of obsequies charges from Rs.10,000/- to Rs.20,000/- - Orders - Issued. 1. G.O.Ms.No.192, GA(SW.I) Department, Dt: 23.04.2010. 1. In the G.O. 1st read above, the Government have enhanced the obsequies charges from Rs.5,000/- to Rs.10,000/- to all the categories of Government employees including All India Service Officers payable to the nearest relative of Government employees or the person lawfully in possession of the body of the deceased Government employees. 2. In the U.O. 2nd read above, the Finance (HRM.IV) Department has requested this Department to take necessary action for enhancement of Funeral Charges to the deceased Government Employees, as per the recommendations made by the 10th Pay Revision Commission to increase the amount of funeral charges to Rs. 20,000/-. Enhance the obsequies charges from Rs.10,000/- to Rs.20,000/- (Rupees Twenty Thousand only) to all categories of Government Employees to meet the expenses on obsequies ceremony, in case of death while in service. 4. The enhanced amount in para (3) above shall be debited to sub detailed Head of Account "310-Grants-in-aid", "312-Other Grant-in-aid" under respective Major, Minor and Sub-Head of Account of the Department concerned and exempted from the Treasury Control and Quarterly Control orders. All Departments of Secretariat and Heads of Departments shall obtain supplementary grant for such expenditure incurred at the appropriate time during the same Financial Year.